USES: This medication contains iodine and potassium iodide. It is used along with antithyroid medicines to prepare the thyroid gland for surgical removal and to treat certain overactive thyroid conditions (hyperthyroidism, thyroid storm). It works by shrinking the size of the thyroid gland and by decreasing the amount of thyroid hormones the body makes. This medication may also be used to protect the thyroid gland after radioactive iodine treatment or in a radiation exposure emergency. 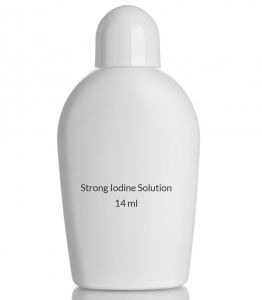 In such cases, this product blocks the thyroid gland from absorbing radioactive iodine, protecting it from damage and reducing the risk of thyroid cancer. In a radiation exposure emergency, use this medication along with other emergency measures that will be recommended to you by public health and safety officials (e.g., finding safe shelter, evacuation, controlling food supply). This medication may also be used for other conditions as determined by your doctor (e.g., treatment of iodine deficiency). HOW TO USE: Take this medication by mouth as directed. Use the dropper that comes with the bottle to measure the correct dose. To improve the taste, mix the dose in a full glass (8 ounces or 240 milliliters) of water, milk, formula, or juice before taking. To decrease stomach upset, take this medication after meals or with food. Do not use this medication if it turns brownish-yellow. Dosage is based on your medical condition and response to treatment. Do not increase your dose, take it more often, or take it for longer than prescribed or recommended because of the increased risk of side effects. In a radiation emergency, take this drug only when public health and safety officials tell you to do so. Start treatment as soon as possible for the best protection. The length of treatment will be determined by public health and safety officials. If so directed, use this medication regularly to get the most benefit from it. To help you remember, take it at the same time(s) each day. Tell your doctor if your condition persists or worsens. SIDE EFFECTS: Nausea, vomiting, stomach ache, diarrhea, metallic taste in the mouth, fever, headache, runny nose, sneezing, or acne may occur. If any of these effects persist or worsen, tell your doctor or pharmacist promptly. Remember that your doctor has prescribed this medication because he or she has judged that the benefit to you is greater than the risk of side effects. Many people using this medication do not have serious side effects. Tell your doctor immediately if any of these unlikely but serious side effects occur: burning mouth/throat, sore teeth/gums, swelling inside the mouth, increased saliva, eye irritation/swollen eyelids, severe headache, swelling of the front of the neck/throat (goiter), signs of decreased thyroid gland function (e.g., weight gain, cold intolerance, slow/irregular heartbeat, constipation, unusual tiredness), confusion, numbness/tingling/pain/weakness of the hands/feet. Seek immediate medical attention if any of these rare but very serious side effects occur: chest pain, black stools, vomit that looks like coffee grounds, bloody diarrhea. A very serious allergic reaction to this drug is rare. However, seek immediate medical attention if you notice any symptoms of a serious allergic reaction, including: rash, itching/swelling (especially of the face/tongue/throat), severe dizziness, trouble breathing, fever with joint pain. This is not a complete list of possible side effects. If you notice other effects not listed above, contact your doctor or pharmacist. In the US - Call your doctor for medical advice about side effects. You may report side effects to FDA at 1-800-FDA-1088. In Canada - Call your doctor for medical advice about side effects. You may report side effects to Health Canada at 1-866-234-2345. PRECAUTIONS: Before taking this medication, tell your doctor or pharmacist if you are allergic to iodine or potassium iodide; or if you have any other allergies. This product may contain inactive ingredients, which can cause allergic reactions or other problems. Talk to your pharmacist for more details. This medication should not be used if you have certain medical conditions. Before using this medicine, consult your doctor or pharmacist if you have: current attack/worsening of bronchitis, a certain type of skin condition (dermatitis herpetiformis), a certain type of blood vessel disease (hypocomplementemic vasculitis). Before using this medication, tell your doctor or pharmacist your medical history, especially of: any thyroid problems (if you are taking this medication for non-thyroid conditions), heart disease, tuberculosis, high level of potassium in the blood, kidney disease, Addison's disease, a certain muscle disorder (myotonia congenita). Caution is advised when this drug is given to newborn babies younger than 1 month old. Repeated dosing increases the risk of blocking thyroid function, possibly affecting the newborn's brain development. Discuss the risks and benefits with the doctor. Treated babies should be given thyroid function tests. During pregnancy, this medication should be used only when clearly needed. Repeated dosing increases the risk of blocking thyroid function in the unborn baby, possibly causing harm. Discuss the risks and benefits with your doctor. This drug passes into breast milk and may have undesirable effects on a nursing infant. Consult your doctor before breast-feeding. DRUG INTERACTIONS: Your doctor or pharmacist may already be aware of any possible drug interactions and may be monitoring you for them. Do not start, stop, or change the dosage of any medicine before checking with your doctor or pharmacist first. Before using this medication, tell your doctor or pharmacist of all prescription and nonprescription/herbal products you may use, especially of: ACE inhibitors (e.g., captopril, lisinopril), angiotensin receptor blockers (ARBs such as losartan, valsartan), certain "water pills" (potassium-sparing diuretics such as amiloride, spironolactone, triamterene), drospirenone, eplerenone, lithium, drugs that contain potassium (e.g., supplements such as potassium chloride). This document does not contain all possible interactions. Therefore, before using this product, tell your doctor or pharmacist of all the products you use. Keep a list of all your medications with you, and share the list with your doctor and pharmacist. OVERDOSE: If overdose is suspected, contact your local poison control center or emergency room immediately. US residents can call the US National Poison Hotline at 1-800-222-1222. Canada residents can call a provincial poison control center. Symptoms of overdose may include: stomach pain, nausea/vomiting, severe diarrhea, trouble breathing, weakness. NOTES: Do not share this medication with others. Laboratory and/or medical tests (e.g., thyroid function tests) should be performed periodically to monitor your progress or check for side effects. Consult your doctor for more details. STORAGE: Store at room temperature between 59-86 degrees F (15-30 degrees C) away from heat, light, and moisture. Keep the container tightly closed. Do not freeze. If crystals form in the solution, dissolve them by placing the closed bottle in a container of warm water, then gently shake the bottle. Do not store in the bathroom. Keep all medicines away from children and pets. Do not flush medications down the toilet or pour them into a drain unless instructed to do so. Properly discard this product when it is expired or no longer needed. Consult your pharmacist or local waste disposal company for more details about how to safely discard your product.